The board runs out [9d][6h][2h][Jd][3c] and Pasquale wins the pot and eliminates Tang in 10th place for $3,719. We have reached the final table of the $600 Deep Stack event. You can watch all the action from the final table by clicking "Watch LIVE Video" at the top of the page. Both events running today at the World Poker Finals are currently on dinner break. - There are 138 players remaining on Day 1 of the $500 Seniors event. When play resumes, the blinds will be increased to 500-1,000 with a 100 ante. The average chip stack is 40,700. - There are 24 players remaining on Day 2 of the $600 Deep Stack event. When play resumes, the blinds will be increased to 8,000-16,000 with a 2,000 ante. The average chip stack is 416,000. $600 Deep Stack Now in the Money! We are down to the final 50 players in the $600 No-Limit Hold 'em Deep Stack event. All players are now in the money. 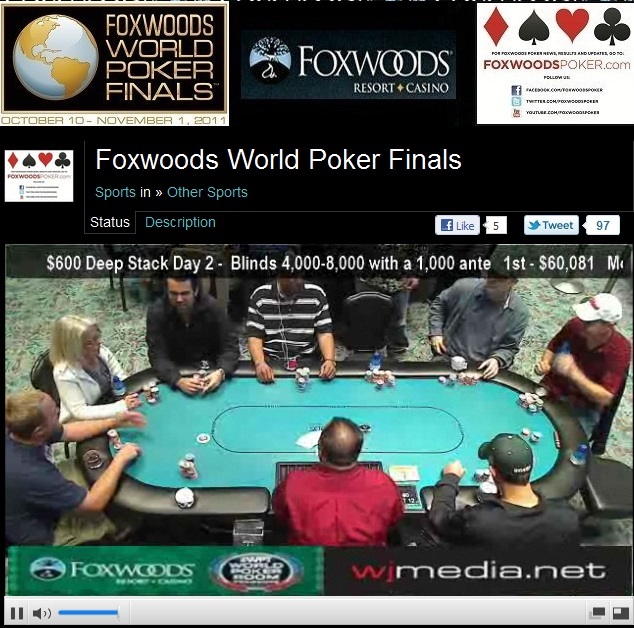 We had a total of 277 players in the $500 Seniors NLHE Deep Stack event at the Foxwoods World Poker Finals. The final day of the $600 Deep Stack event is about to resume play. You can watch the live feed of today's action by clicking "Watch LIVE Video" at the top of the page. Blinds will be 1,500-3,000 with a 400 ante to start play today. $500 Seniors Deep Stack Event Underway! The $500 Seniors Deep Stack event is now underway. Players are starting with 20,000 in chips and the levels are 45 minutes in length.